Welcome to our claim site. Please enter store name and address. You're now ready to submit your claim. This two-year manufacturer’s warranty covers defects in materials and workmanship of PanzerGlass products (the “product”) for the Warranty Period described below. PanzerGlass (“we”) extends this two-year manufacturer’s warranty only to the individual consumer who originally purchased the product (“you”). It does not extend to any subsequent owner (for example, if you sell the product, the buyer cannot obtain warranty service). This warranty covers manufacturing defects only, which include defects in materials or workmanship. This two-year manufacturer’s warranty does not cover any damage due to: (a) improper use; (b) device upgrades, repairs or replacements that impair the functioning of the PanzerGlass product; (c) improper installation; (d) failure to follow the product instructions; (e) modifications; (f) unauthorized repair; or (g) abuse or misuse of the product. The warranty does not apply to normal wear and tear. This two-year manufacturer’s warranty is valid two years, starting on the date of retail purchase of the product (the “Warranty Period”), or the replacement/repaired product. If you discover a defect before you use the product (such as such as discoloration, faulty silicone adhesive, warping, rainbow line discoloration, scratches, oil marks or impurities in or on the product), please return the product to the retailer where you purchased it. With respect to any defective product during the Warranty Period, we will, in our sole discretion, either: (a) replace such product (or the defective part) free of charge; (b) provide a product of comparable value; or (c) provide a credit to purchase a different PanzerGlass product. To obtain warranty service, please submit a warranty RMA claim through www.rma.panzerglass.com by providing the product’s serial number, a copy of the original receipt, and a photo of the defective PanzerGlass product. All warranty claims are subject to approval by PanzerGlass, which may reject warranty claims in its reasonable discretion. Upon approval of the claim by PanzerGlass, you will either receive a replacement of the PanzerGlass product, or a PanzerGlass product of equal value, within 7-10 business days. 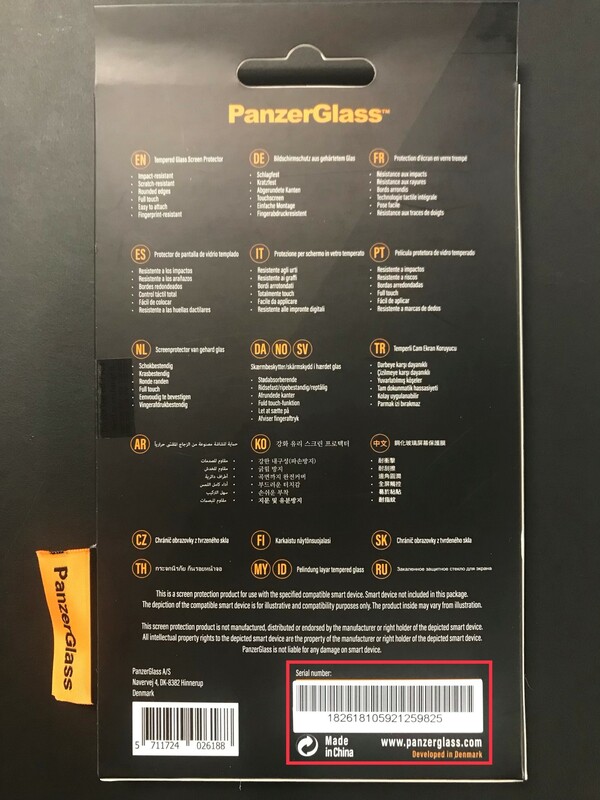 Proof of purchase, to validate that the product is an original PanzerGlass, and was purchased from an authorized reseller, is required to claim a defect PanzerGlass. If you did not find your answer above, please contact rma@panzerglass.com. · What personal information is collected by PanzerGlass through our RMA Platform. · How PanzerGlass uses this information. · With whom PanzerGlass may share personal information. · What choices are available to you with respect to collection, use and sharing of this information. · What types of security procedures are in place to protect the loss or misuse of this information under our control. By accessing or using the RMA Platform, or by clicking the “accept” button when you register to use a Service, you consent to our use of your personal information as described in this Policy. This Policy may change from time to time. Your continued use of the RMA Platform after we make changes is deemed to be acceptance of those changes, so please check the Policy periodically for updates. We collect information from you in two ways. First, you provide us with certain information when you use our RMA Platform. Second, we collect certain information automatically as you interact with our RMA Platform. · Identifying information. We may collect personally identifying information, including your name, email address, address, and phone number. Information collected through our cookies and web beacons. We (or service providers on our behalf) may use technologies, including “cookies” and “web beacons” to automatically collect information from you when you use the Services. Cookies are small amounts of data that are stored within your Internet browser that saves and recognizes your earlier browsing. Web beacons are web page elements that can recognize certain types of information on your computer or mobile device such as cookies and the time and date of a page or email viewed. You can delete cookie files from your hard drive, or avoid them altogether, by configuring your browser to reject them or to notify you when a cookie is being placed on your hard drive. Not all features of the Services will function as intended if you reject cookies. The information we collect automatically is statistical information and may include personal information, or we may maintain it or associate it with personal information we collect in other ways or receive from third parties. If you do not want us to collect this information, do not use the RMA Platform. Your Internet browser and mobile device may allow you to adjust your browser settings so that “do not track” requests are sent to the websites you visit. PanzerGlass does not track its users over time and across third-party websites to provide targeted advertising and therefore does not respond to Do Not Track signals. · for any other legal or business purposes that are not inconsistent with the terms of this Policy. We may also combine information we collect about you through the RMA Platform with other information about you that we receive through other means or from third-party sources. We may share your personal information with our third-party service providers who provide services to us or on our behalf, such as payment processors and website developers. These third-party service providers are restricted from using your personal information for their own marketing purposes. · we believe that you have abused a Service by using it to attack or gain unauthorized access to a system or to engage in spamming or other conduct that violates applicable laws or the PanzerGlass Terms of Service. We may share aggregate or de-identified information without restriction. While this information will not identify you personally, in some instances these third parties may be able to combine this aggregate information with other data they have about you, or that they receive from third parties, in a manner that allows them to identify you personally. We do not share personal information with companies for those companies’ marketing purposes, so California Civil Code sections 1798.83-1798.84 does not apply. We have implemented commercially reasonable measures designed to secure your personal information from unauthorized access, use, alteration and disclosure. For example, database information is kept separate from live servers, and is firewall protected. However, the transmission of information via the Internet is not completely secure. You acknowledge that: (a) the limitations of the Internet are beyond our control; (b) the security, integrity and privacy of information and data exchanged between you and us cannot be guaranteed; and (c) any such information and data may be viewed or tampered with in transit by a third party. PanzerGlass has no responsibility or liability for the security of information transmitted via the Internet. The RMA Platform is not intended for users younger than 18. We do not knowingly collect contact information from children under the age of 13 without verifiable parental consent. If we become aware that a visitor under the age of 13 has submitted personal information without verifiable parental consent, we will remove his or her information from our files.